Will my mill be next? 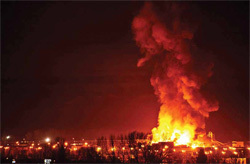 The haunting feeling of another sawmill explosion and fire is accompanying every sawmill worker reporting for their work shift well beyond the scene of two recent devastating incidents in central British Columbia. Official investigations into the possible causes of the two incidents that have shaken—and united—the forest industry like few before it, will take weeks or months to run their course. But the forest industry and regulatory agencies have been galvanized into action to help prevent any further horrifying incidents. The first explosion and fire occurred on a frigid January evening at the Babine Forest Products sawmill east of Burns Lake. Two workers were killed, 19 injured and everyone involved traumatized. The emotions were compounded three months later when an eerily similar explosion and fire levelled Lakeland Mill’s sawmill in downtown Prince George. Two workers were lost in that incident and 22 more injured. Regulatory agencies like WorkSafeBC and the B.C. Safety Authority were quick off the mark to launch official investigations into the possible causes of the two events. In the meantime, advisory orders were issued to the province’s sawmills to closely investigate hazard abatement in their operations, particularly the accumulations of fine dust associated with processing the increasingly dry wood killed by the mountain pine beetle epidemic in the B.C. Interior. By early May, 341 sawmill operations throughout B.C. had taken internal mitigating measures to reduce or eliminate dust accumulations in their operations, reported Roberta Ellis, WorkSafeBC’s senior vice president. Also early in May, CEOs from major wood product manufacturing companies in B.C. announced an unprecedented collaboration to create a joint action plan for improving safety. The CEOs will establish and lead a task force to quantify combustion risks related to dust from processing both green and dry wood along with management practices for dust control in a wood plant manufacturing environment. “We are also committed to developing a set of clear and auditable standards that will be utilized to independently assess the safety of mills across the industry,” declared the CEOs under the signatures of Don Kayne, representing Canfor Corporation; Hank Ketcham, West Fraser Timber; Brad Thorlakson, Tolko Industries; Don Demens, Western Forest Products and Ken Shields, Conifex. Other forest companies including Ainsworth, Interfor, Dunkley Lumber the Sinclar Group and Hampton Affiliates endorsed the initiative. “We will work with experts across disciplines and other stakeholders to ensure these standards are comprehensive and can be relied upon to provide assurance that conditions in mills across British Columbia are safe for workers,” continue the CEOs. Also early in May, the B.C. Safety Authority ordered what many mills have already begun: to update safety procedures; to maintain valid operating permits; renew maintenance procedures where necessary and be diligent in reporting incidents. Companies have until July 13 to comply with the safety procedures and inform the B.C. Safety Authority accordingly. 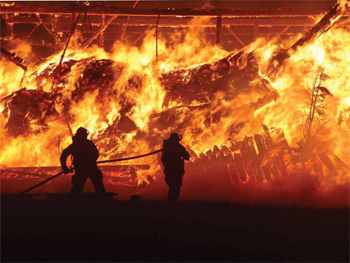 One of the reasons fine dust is being targeted as a possible or contributory cause of the mill explosions and fires is because its risk factors have been relatively well documented. The Vancouver Sun reported that two forest companies, not active in the B.C. central interior, had been alerted to the explosion potentials associated with dust accumulations. Norbord Industries Inc., was alerted to the risk after a dust explosion at a particleboard plant in the U.K. in 2004. Weyerhaeuser has had a combustible dust control program since 2009, following a dust-caused explosion at a Georgia sugar plant that killed 14 people. 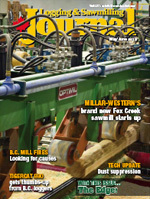 Sawmills and pellet plants in the B.C. Interior have also reported fires triggered by explosions where dust was deemed to be a contributory factor. Sawdust generally and super dry dust produced when processing beetle killed pine trees particularly poses more than respiratory risks. “There is no question, discussing this within the industry as we have, that the dust properties are different,” says Roberta Ellis of WorkSafe BC. However, WorkSafeBC, the other investigative agencies involved and the mill owners are careful not to leap to any premature conclusions concerning the definitive causes of the Babine and Lakeland explosions and fires. The investigations will run their course and examine all available evidence, however long the process takes. The explosions and fires at two sawmills in central British Columbia this year created horror, disbelief and an unprecedented outpouring of support from the forestry family and beyond. The sawmill conflagrations at Burns Lake and Prince George took four workers' lives, severely injured many others and traumatized an industry. The scope of financial and emotional support for the stricken workers and their families in the wake of the tragedies is continuing. There are several ways people can help. The outpouring of sympathy and support for Babine Forest Products and Lakeland Mills’ employees has been overwhelming and already over $900,000 has been raised. Local businesses and individuals ranging from grocery stores to school children have contributed to the established funds to assist Lakeland’s and Burns Lake workers and their families. Logging and Sawmilling Journal has donated $1,000 to each of the two funds, and encourages others in the industry to donate to support this very worthy cause.